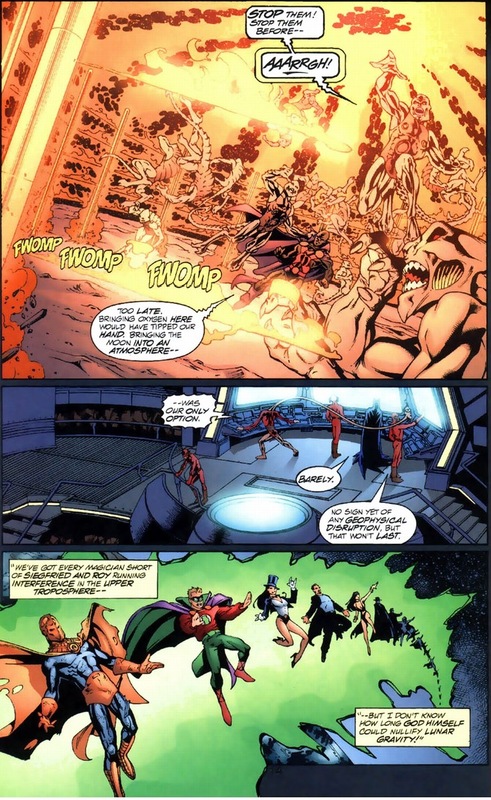 As we left off on Monday, Martian Manhunter escaped from his torture prison, destroyed the fire-abolishing towers, and gave the Justice League that small glimmer of comeback they needed to take on dozens of wildly powerful White Martians. While the war’s far from over, at least now the Justice League can choose the battlefield. And allies. And pets. Thankfully, as comics become more mainstream with the success of the movies, TV shows, etc., we as fans can be less embarrassed to admit our love of an essentially adolescent concept. But one thing I’m never ashamed to admit I love? A dog with superpowers battling a horde of angry aliens. 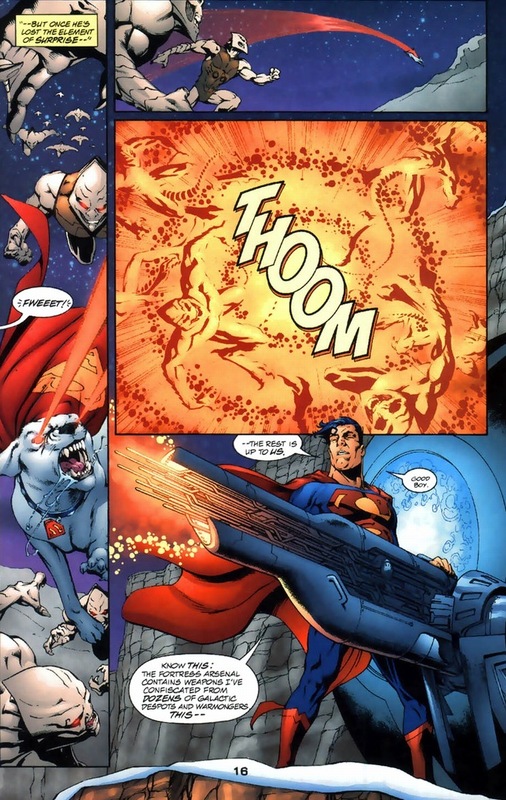 Teenage fantasies aside, as the one thing Lex Luthor and I have in common is our deep rooted wish to be Superman, I’ll never get enough of animals in capes that fight hordes of world-destroying superbeings. And speaking of awesome adolescent concepts? 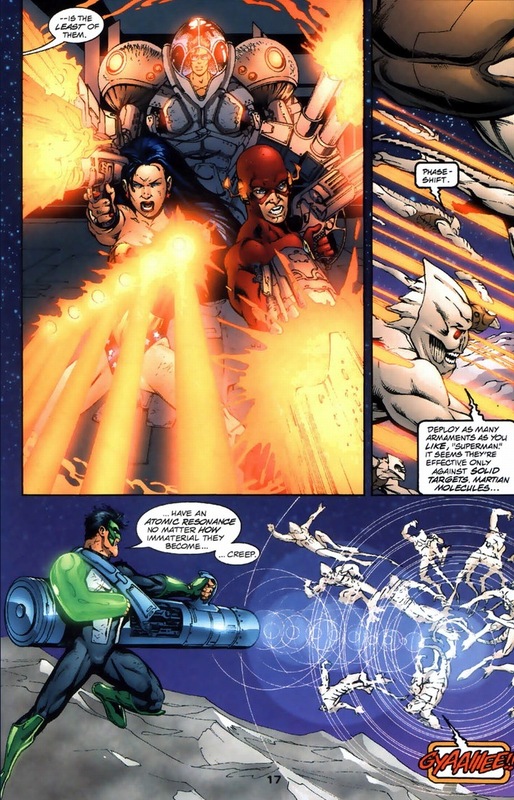 But even with an arsenal of space weapons, the Justice League loses. Oh, spoiler alert. Protex establishes himself firmly as a stereotypical evil mastermind. Because y’see, just because the Justice League can’t punch their way to victory, they have a cunning their enemies don’t possess. I mean, sure, not for the first three issues of this arc, but it’s a slow burn. What happens next can only be described as the Greatest Thing I’ve Seen In Comics. 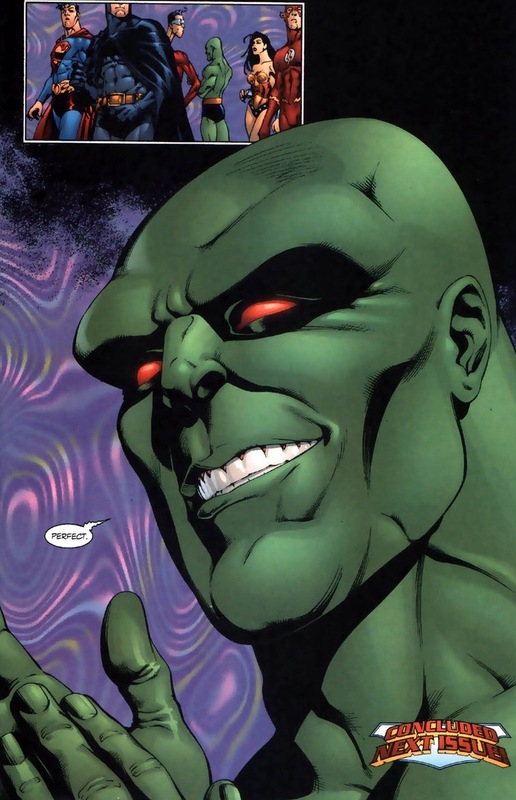 We all see Martian Manhunter described as a humor-less, boring superhero who shows more skin than any other member of the Justice League (and he’s single, ladies), but only a fascinating genius can come up with this plot to finally stop the White Martians. Y’know, the Greatest Thing I’ve Seen In Comics. We, the readers, start off the fight just as nonchalant as the White Martians. It’s a battle on the moon! Blows get exchanged! The White Martians brag about their superior superpowers! 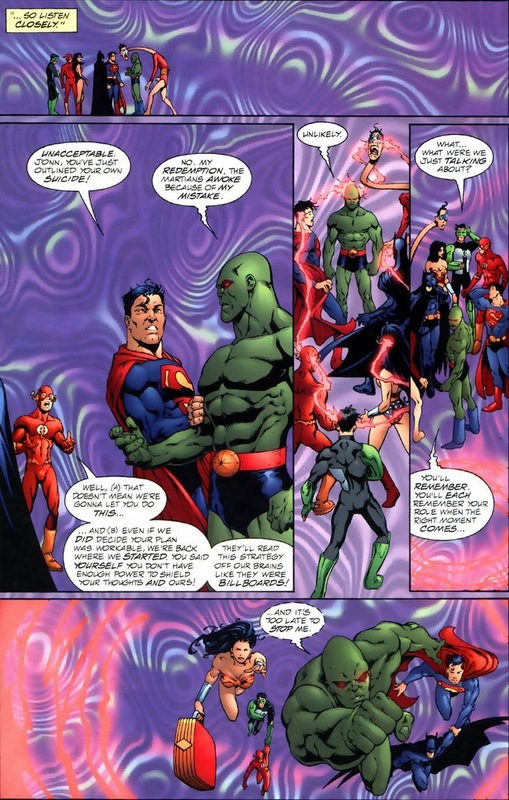 The Martian Manhunter puts his clothes back on! All that normal stuff, and then finally the big reveal. The White Martians never stood a chance against this level of insanity. Yes! 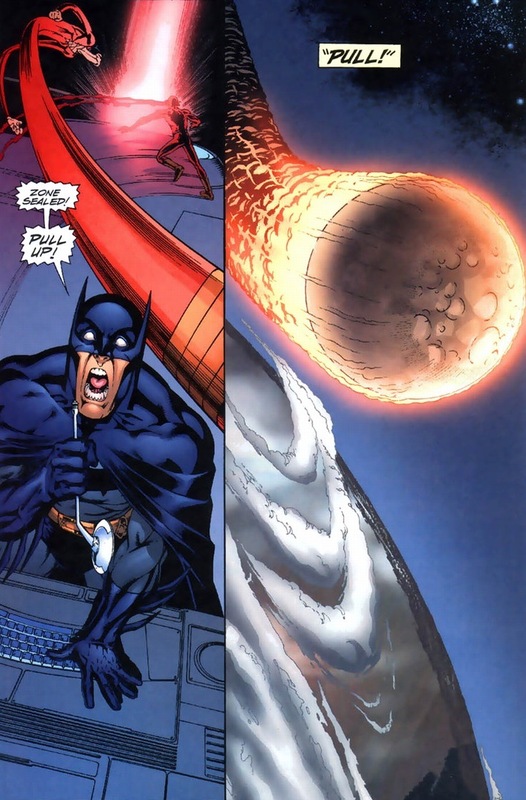 The Justice League is literally pulling the moon. With their muscles. They wrapped a chain around the entire thing, flexed a little bit, and are now literally dragging it out of orbit. 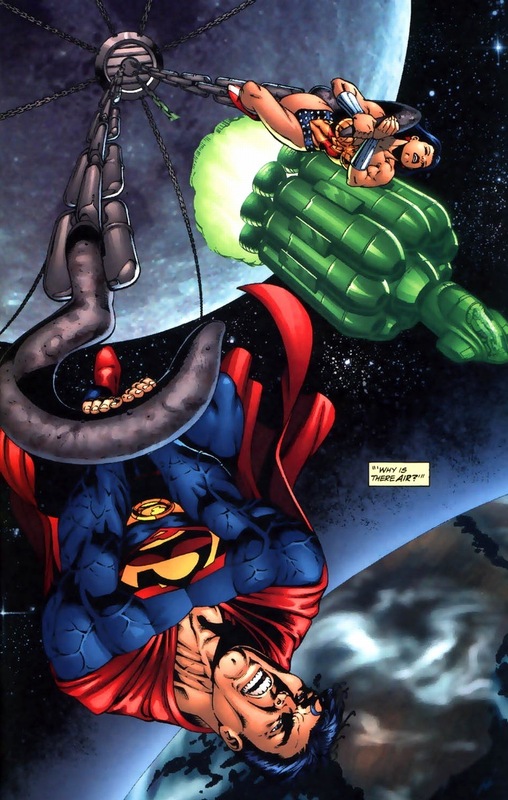 Over the past year and a half, I’ve stated no less than five times that Superman has the ability to bench press small planets. And now, in all the brilliant glory laid out above — I have proof. I feel like I’m a cult leader who has been shockingly proven correct. Turns out that barn I claimed housed our spaceship messiah actually packed a Jesus-filled rocket ship the whole time. 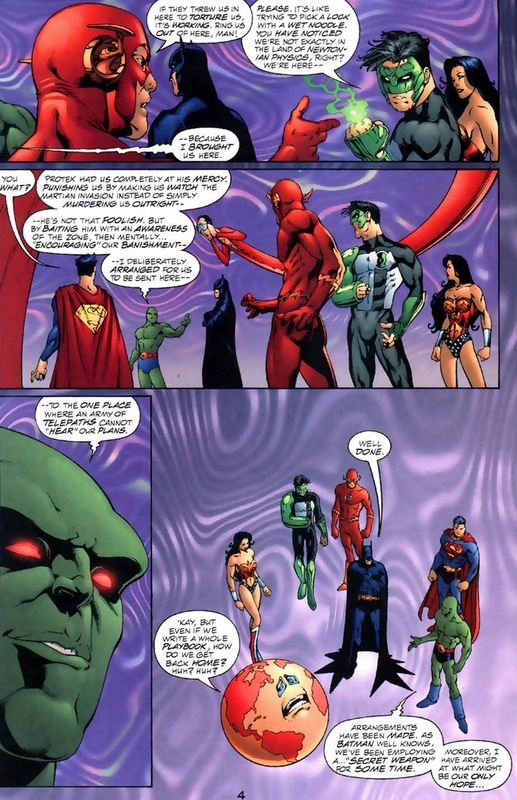 Also, did you know the Justice League has a moon-sized chain? 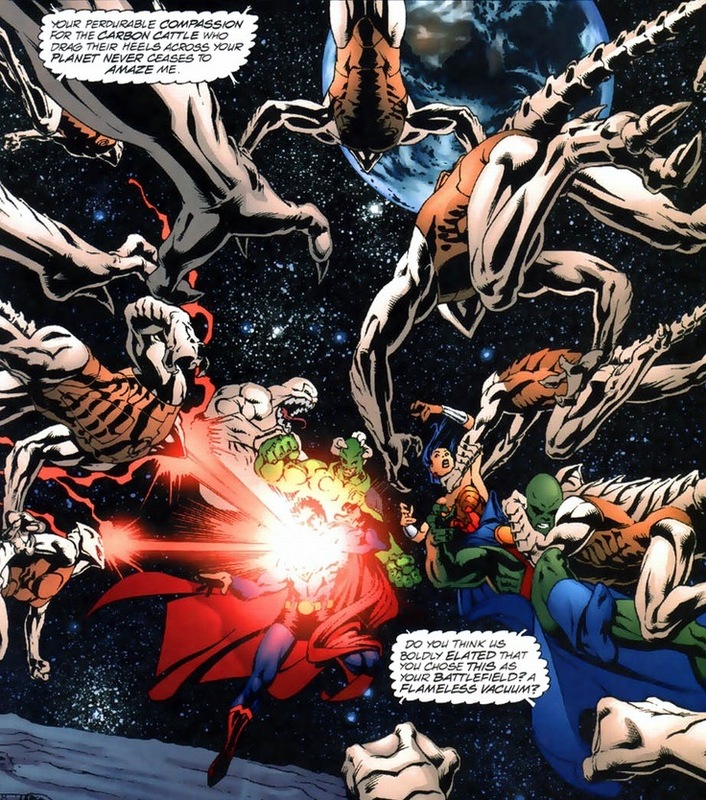 But back to Martian Manhunter’s plot, why the whole moon yanking? Remember the Martian weakness to fire? 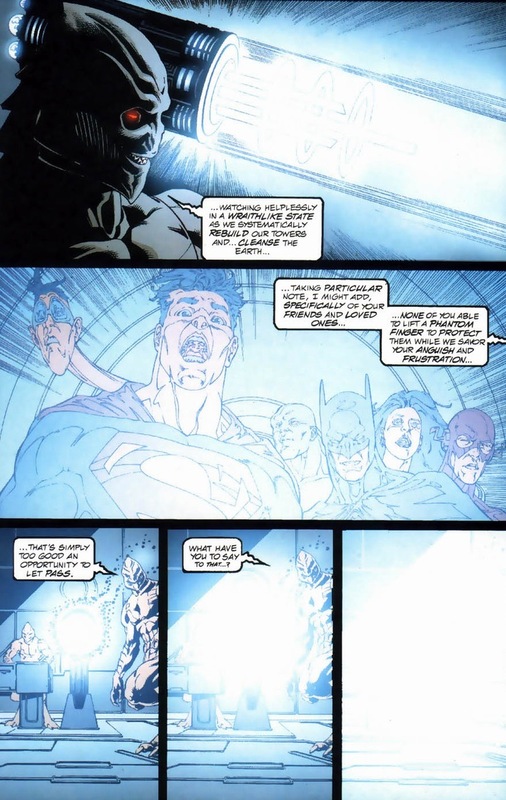 Did you wonder how the Justice League escaped the Phantom Zone? 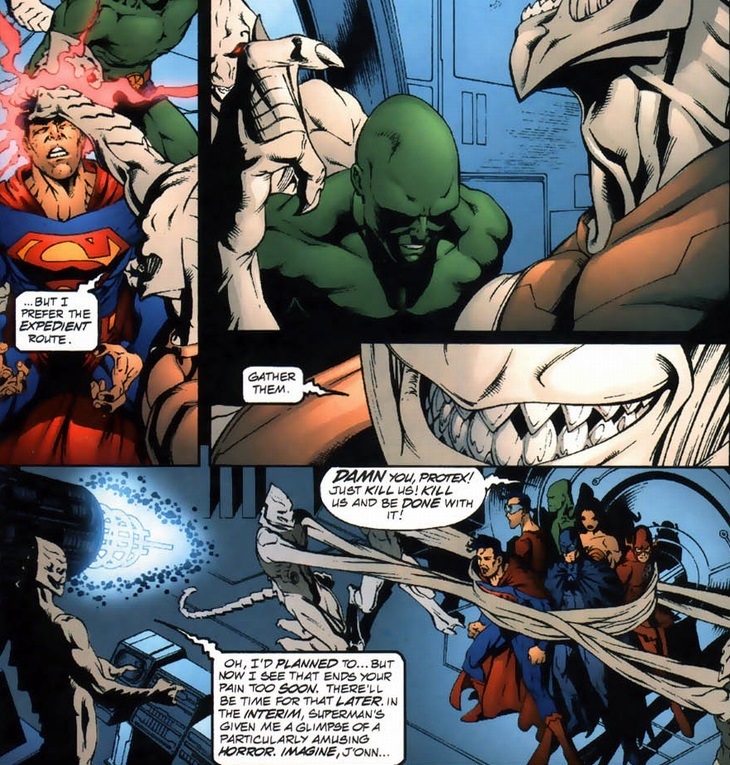 How Martian Manhunter broke free from his torture? My dear friend Gecho nailed the hidden clue back in part one. And thank goodness, because I didn’t realize this until he pointed it out. 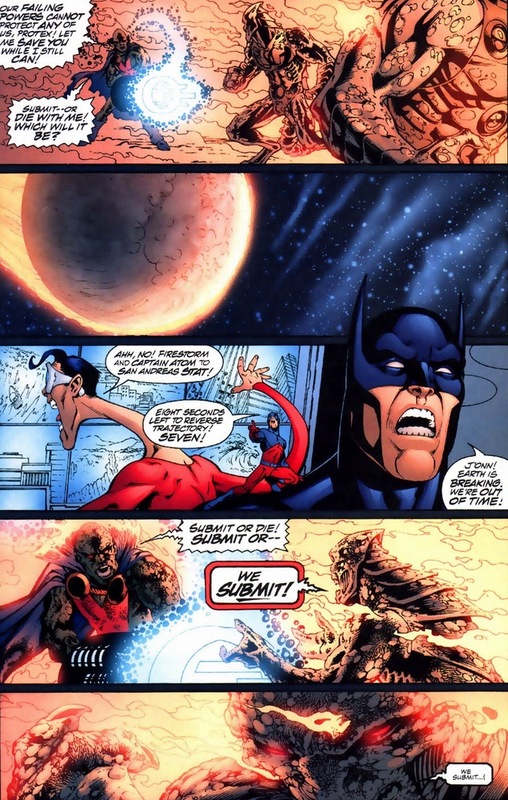 Notice last article when Martian Manhunter uncharacteristically yells out to Batman, “You have given me the ray of hope we need!” Now return to Martian Manhunter’s big reveal in the page above. 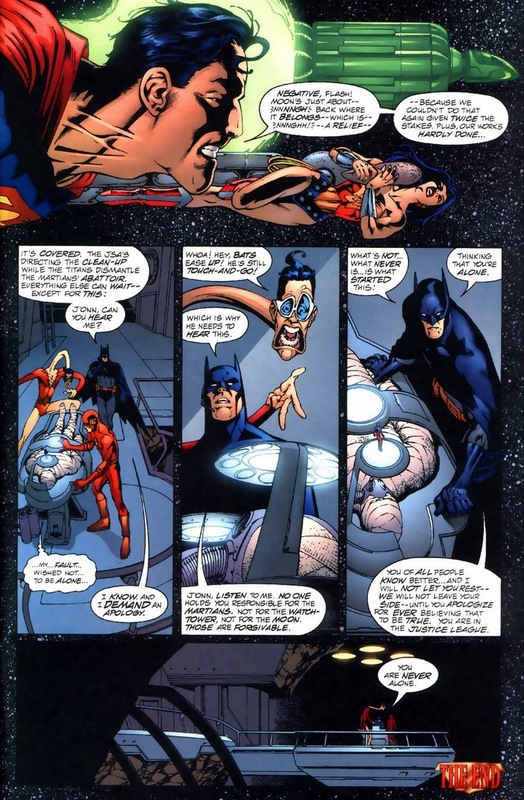 The superhero Atom (who can shrink to microscopic size) squirreled away in Martian Manhunter’s brain, unable to be discovered by the White Martians. 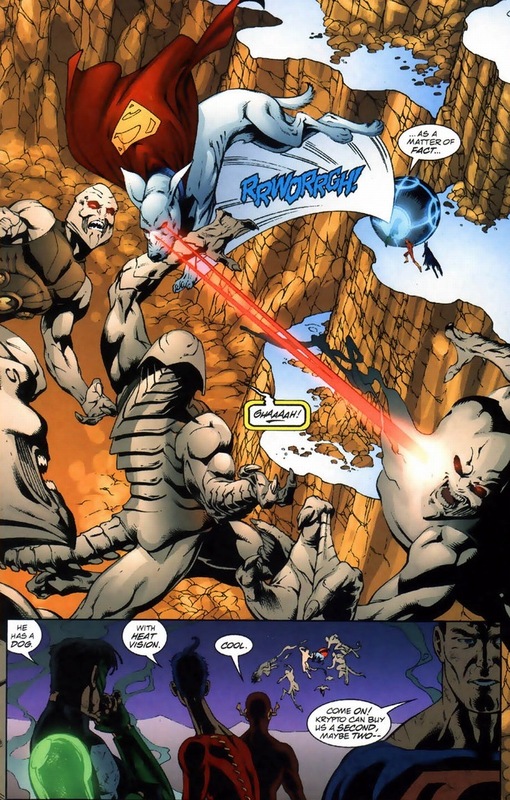 He released Martian Manhunter from the bounded torture. He freed them from the Phantom Zone. 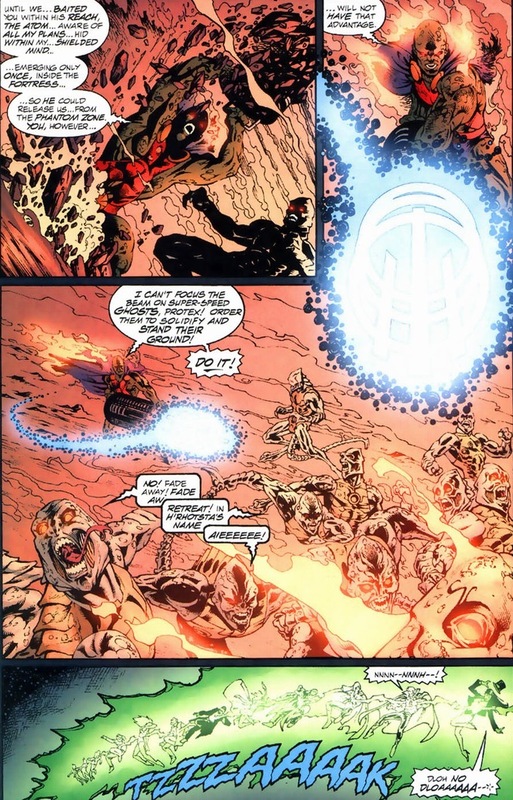 And the Atom’s real name? 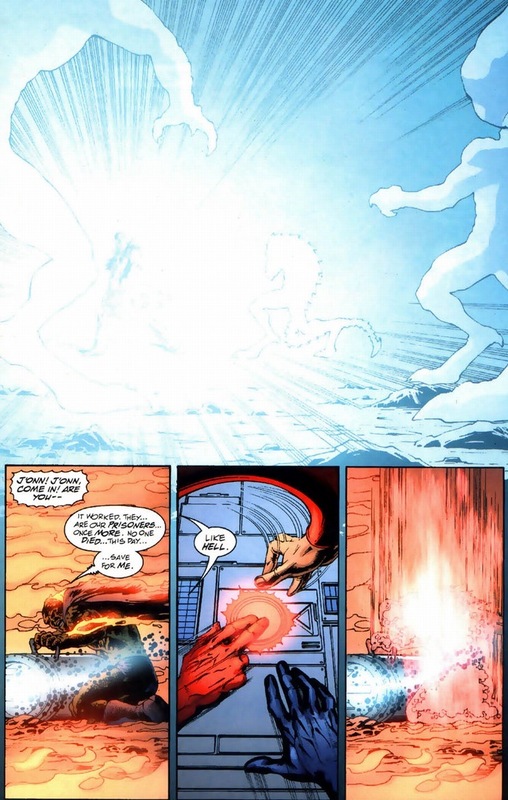 Ray Palmer — y’know, the “ray of hope.” The whole set up to take down the White Martians started as soon as Batman attempted his botched solo rescue way back in the second issue of the arc. Mark Waid’s a genius and I’m jealous of him in every way. Oh, and the White Martians? Will they choose eternal Phantom Zone prison or fiery death? Time for the dramatic finale! 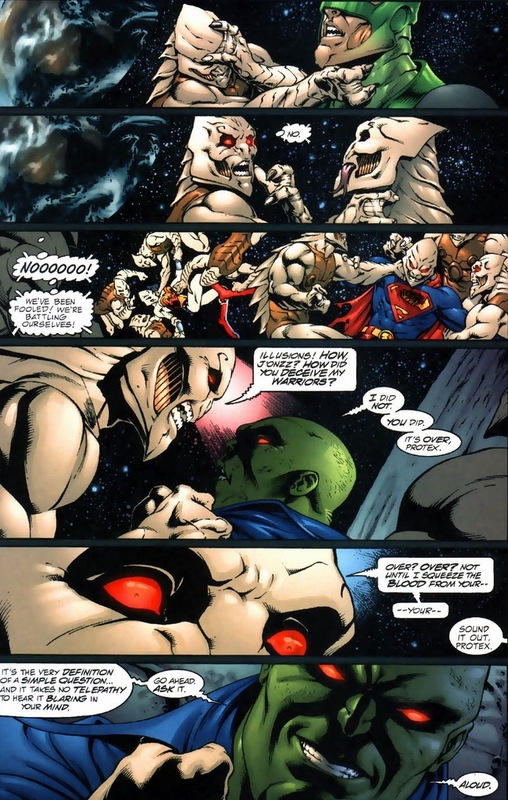 The fate of Martian Manhunter? The selfless superhero who scorched himself to protect his adopted home from the remnants of his evil kin? While Batman only deals in tough love, he does love. And so do I. Martian Manhunter forever. 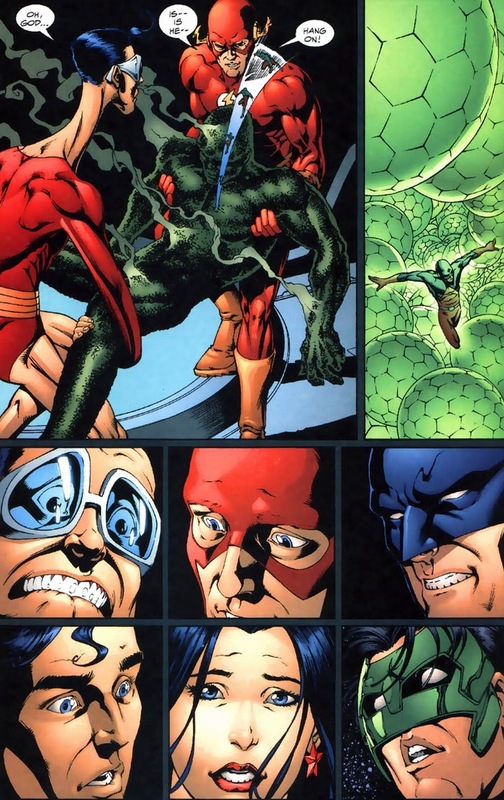 There’s so much to love about this arc, but I have a soft, warm spot in my heart for the panel showing Plas and Batman lunging for the big red “Save J’onn” button and Flash, of course, beating both of them to it.